On Christmas Eve, a neighborhood where a young girl vanished mysteriously years before is terrorized by a psychopath dressed in a Santa suit. Christmas themed slasher films have gained quite the following among horror fans. 1974's Black Christmas remains one of the most revered and influential slasher films of all time, and beyond that, films such as To All a Goodnight, Don't Open til Christmas, Christmas Evil and of course the highly controversial Silent Night Deadly Night all have massive cult followings. Just last year, Slasher Studios released their Christmas themed slasher Dismembering Christmas to positive reception. So when fans learn of a new killer Santa or Christmas themed slasher flick they are sure to get excited, but an obvious question that arises may be: what on earth can this one do that we haven't seen already? Fortunately, All Through the House is eager to answer that very question. 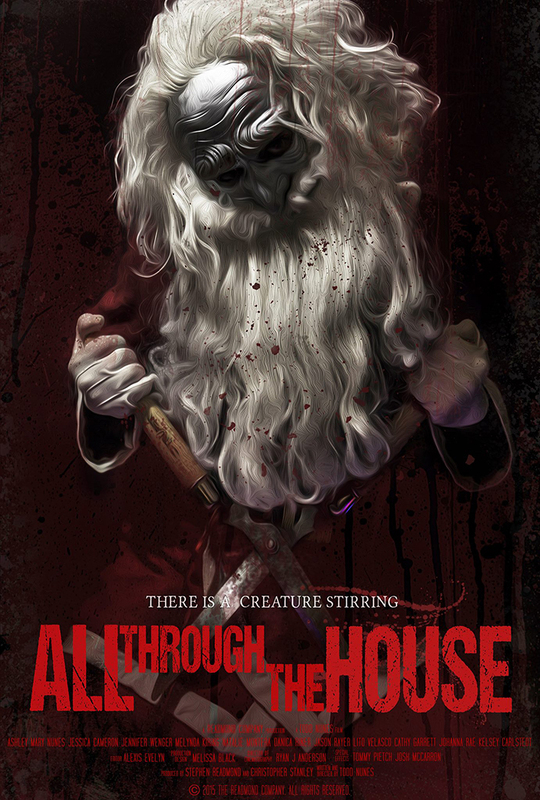 All Through the House starts with a gory bang, letting viewers immediately know what they are in for in terms of gore and violence as the killer Santa brutally disposes of two unsuspecting victims. The gruesome deaths are shown in all their blood soaked glory--a trend that continues throughout the film and that will satisfy gore hounds who have become jaded by the onslaught of off screen death scenes featured in many recent horror films. After the opening scene, we're introduced to our protagonist, Rachel, who is home from college for Christmas and a few of her childhood friends. While she should be excited to be home, it seems that Christmas in her neighborhood conjures memories of the mysterious disappearance of a neighbor girl years before. Unfortunately, she is forced to confront the mystery full force when she and her friends agree to stick around a bit before a night out to help the mother of the vanished girl decorate her home for Christmas. Secrets are revealed and blood spills as the killer Santa terrorizes the neighborhood armed with a pair of hedge clippers. What is immediately obvious is that writer and director Todd Nunes is very much a fan of the 80's slasher genre and also very much respects it. While there are definitely comedic elements to the film, the underlying tone is very serious and dark and there are very well executed homages to several slasher films from the golden age of the genre. But unlike these often formulaic and cliched films, All Through the House manages to deliver some serious plot twists and the big reveal(s) during the film's climax are satisfyingly jaw dropping. Additionally, there are some wonderfully tense and suspenseful chase scenes and killer's psycho Santa mask is unsettling; the crisp and tight cinematography add the the impact of these scenes. For instance, one of the female characters finds herself being stalked just outside the house and just out of view of her friend inside, creating some true edge of your seat suspense. Couple this with the fact that virtually every scene is replete with Christmas decor (including some unsettling Santa mannequins!) and there is a palpable creep factor and sense of uneasiness present throughout the film. The acting also needs to be praised; everyone involved does a great job with Ashley Mary Nunes as Rachel and Melynda Kiring as Mrs. Garrett being the standouts. The later especially is a blast to watch and certainly has to be one of the more memorable slasher characters of the last decade. Mrs. Garrett is truly challenging role that requires a lot of delicate balancing of emotions and intentions and Kiring bites into it with tremendous commitment and voracity. Nunes' directing is also impressive, allowing the nuances of the story and characters to be fully realized while highlighting and even improving upon the best of the traditional slasher conventions. Of course, no film is perfect and All Trough the House does have some very minor issues. There are several scenes of random neighborhood residents becoming prey for the crazed Santa. While these scenes are fun and extremely bloody, they sometimes feel disjointed due to the lack of any effective transitions; essentially these are simply scenes inserted to up the body count and gore factor, which is perfectly fine--this is a slasher film after all! However, the pacing is slightly thrown of by these scenes, which periodically pop up. In one scene, we see the deranged Santa silently stalking our three main girls, then a quick cut to a completely different home with characters the audiences hasn't seen before who we can only assume are in the same neighborhood. It's a minor complaint to be sure, but it does slightly affect the cohesiveness of the film. Also, the climax does come very close to running out of steam and probably could have been trimmed of a few minutes. But again, minor complaints that take nothing away from the film's enjoyment factor. Make no mistake; this is a very solid film from start to finish. Overall, I can boldly say that you perhaps will not see a better slasher film this year. All Through the House is replete with all a true slasher fan could ask for and the carefully constructed references to various genre favorites will surely garner tons of giddy grins from fans. Even non-slasher fans will find themselves immersed in unraveling the mysteries of the plot. And this is perhaps where the film deserves a ton of credit; while it's unapologetically a slasher film, the plot is by no means cliched, but instead is quite layered and complex for such a film allowing those who may not necessarily be fans of the genre to certainly appreciate it. Nunes explores some very dark and taboo themes, but is also careful not to go over the top, as the events stay grounded in reality and never feel outrageous. The climax is grimly satisfying as well and begs for repeated viewings. Along with Black Christmas and Silent Night Deadly Night, All Through the House should become a holiday tradition for horror fans; that truly is saying a lot.